Have You Ever Stepped on a Bindii? My front yard doesn’t have any grass. Well, there’s no grass that we have planted. It is mostly dirt, and I like it that way because it is pretty maintenance free. In my front yard I have planted some raised beds with fruits and vegetables. Our family also has some flowers and shrubs and vines. It’s not much, but watering everything in this desert is time spent relaxing each day. As I water, though, other things tend to sprout in our yard. We get some grasses and dandelions. We get some tumbleweeds. We get some bindii. Maybe you’ve never heard of bindii. It’s also know by several other names: bullhead, cat’s head, devil’s eyelashes, devil’s thorn, devil’s weed, and goathead. 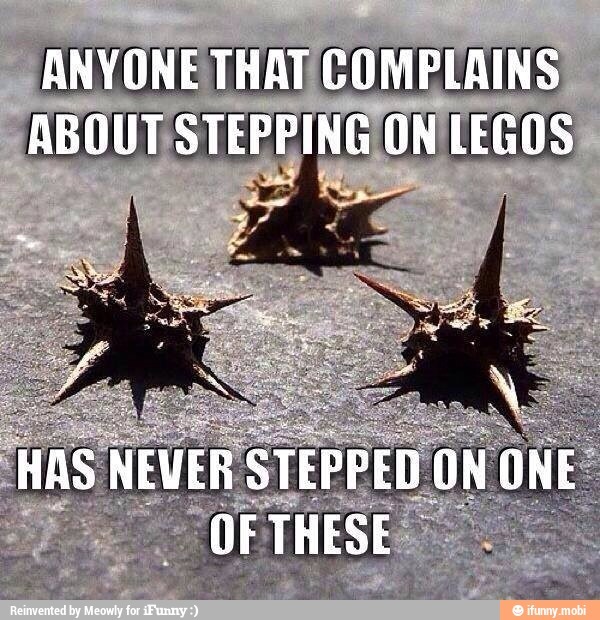 People that complain about stepping on legos have never stepped on a goathead. These plants, once they have formed the thorny seeds, can poke through a flip-flop. When you step on one barefoot you have to manually remove it from your foot. They are excruciatingly painful. The problem with goatheads is that they pop up randomly throughout the summer – all over the place – and they spread rapidly. When the plants first appear they seem harmless enough, but by the time they have begun to produce pretty yellow flowers they are already thorny. I have to admit I’m pretty lax in pulling weeds. Every day I water the plants and see the goatheads. Every day I think about how I need to pull them when I’m done. I think about how easy it is to pull those new plants before they get painful and produce the devilish seeds, but i don’t. This is what is happening in our churches. It is what is happening in Christianity all across our nation. We have weeds of sin that sprout up in our lives and in the lives of those we love who share our faith in Jesus, but because of grace we sit back and ignore the consequences of leaving those sins not dealt with. We are reaping the consequences now as we watch our nation of churches become more and more identical to the world around us. We revel in our tolerance though we claim outrage when the world continues to spiral toward condemnation. I believe in grace. It is the single thing that I have been given that causes me joy beyond joy, but I understand that grace is not meant to be cheapened by my lackadaisical approach to sin in my life or in the lives of those around me. I am watching as our nation makes decisions that go against the foundation upon which it was established. I truly am not surprised that a bunch of humanists would make those kinds of decisions. What I am surprised at is how many faith-professing Christians are endorsing these decisions. I am surprised at the boldness of Christians to live with blatant sins seemingly without conscience on those matters. I am surprised that the church is not taking a stronger stand against the invasion of the world into the church. I am surprised that public repentance is nearly non-existent in most churches. There is a place and time to be culturally relevant, but a Christian and a church must not compromise morality (emulating Jesus) in order to do so. We are not even able to condone the lifestyles of those outside the church that contradict the plan and natural order set up by God Most High (Romans 1:32). The church is supposed to be a place where people can come from every lifestyle and find God, but it is not supposed to be a place that excuses a continuation of sinful behavior in the name of grace. If you want life change through forgiveness come to Jesus. If you want your conscience eased while you continue in your sinful ways look elsewhere. We have watched as weeds of sinfulness have crept into our churches, and we have sat idly by as those weeds became thorns and seeded new growth. It’s time to call it what it is: sin. It is time for the church to repent. It is time to come back to an understanding of the severity of sin and run from it like Joseph ran from Potiphar’s wife. It is time to get real with one another in love as we help each other be rid of the sins that imprison us. It is time for the church to stop focusing on the nation coming back to its heritage and come back to our own heritage of emulating the One who lived a sinless life. We will not achieve sinless perfection in this life, but that should not cause us to stop trying and make excuses for what we do. Grace is not given where sin is not repented of (Hebrews 10:26). Wake up church. Quit stepping on the bindii. Repent, so that God can pull the weeds from your life and you can walk fresh in Him again. Forgiveness is available, and grace is given, but repentance is required.